Solving IT puzzles: Use Web Deploy. Period. We had a tech session the other day about DTAP. Our office TFS server was updated to TFS 2012 and we want to install Lab Management and all those fancy gadgets in the near future. We we're talking about how others within our company deploy their stuff. Turns out almost everyone has his or her own way with some script here or there. Right now we're using TFS only as a build server and 'package server' if you will, whereas I'm used to using TeamCity to both monitor the build and for deployments. The big difference between my old work and current, is that in the old job, we owned the DTAP servers and were able to deploy to those. At the new job, we have to provide some 3rd party with an installation package and an instruction manual how to install. More on that some other time - but what I found astonisghing is that a lot of people within my company didn't know about web-deploy. It reminded me of Scott Hanselman's blog back in 2010 (!) 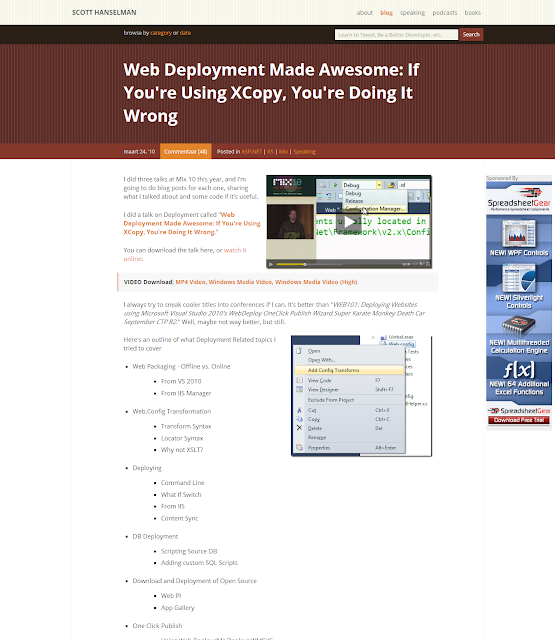 titled: "Web Deployment Made Awesome: If You're Using XCopy, You're Doing It Wrong". Even in the scripts we provide, we use web deploy. So seriously: start using web deploy.